Nothing But Blue by Lisa Jahn-Clough. Review: Are you in the mood for a sweet, haunting story about a young girl overcoming loss? Then Nothing But Blue by Lisa Jahn-Clough is the right book for you. This story will lift your heart up about humanity and the different kind of people in this world. Along the way she meets a telepathic dog-named shadow that becomes her companion. She feels down a lot so she names her self-blue. She comes across a lot of people in a journey to a home that she barely remembers. Some of the people are good people and some people are bad but over all you are left with a good feeling of people. Her story slowly unfolds until you finally find out what happened to her. Overall I think Nothing But Blue is a good book that tells a strong story about a young girl. I would give this book a 4 out of 5 stars because it was just a happy book when you got to the end of it. Although it started out a little slow in the beginning and you don't really know what is going on, later in the book it speeds up and you understand everything. Review written by Morgan (6th grade student). We would like to thank Houghton Mifflin for providing a copy of Nothing But Blue for this review. 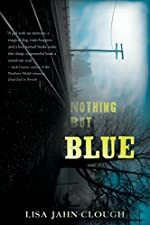 Have you read Nothing But Blue? How would you rate it?